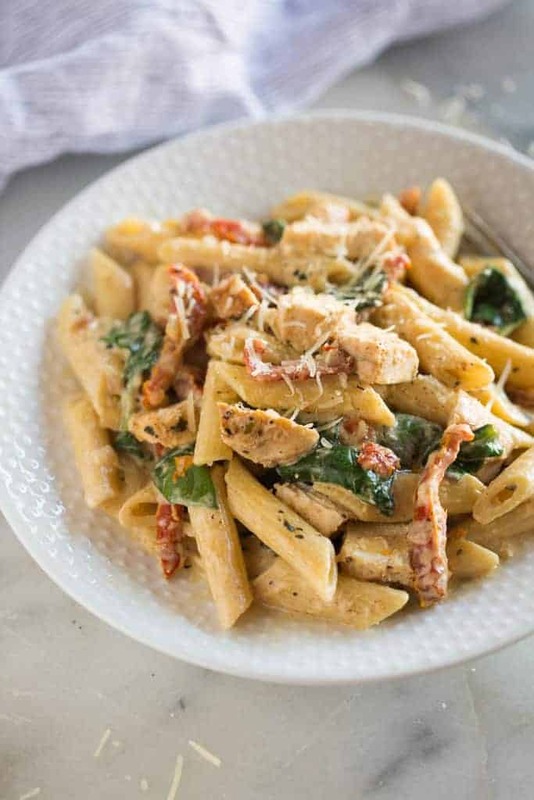 I’ve had so much fun recipe testing instant pot recipes, and I’m sooooooo excited to share this Instant Pot Tuscan Chicken Pasta with you all today. 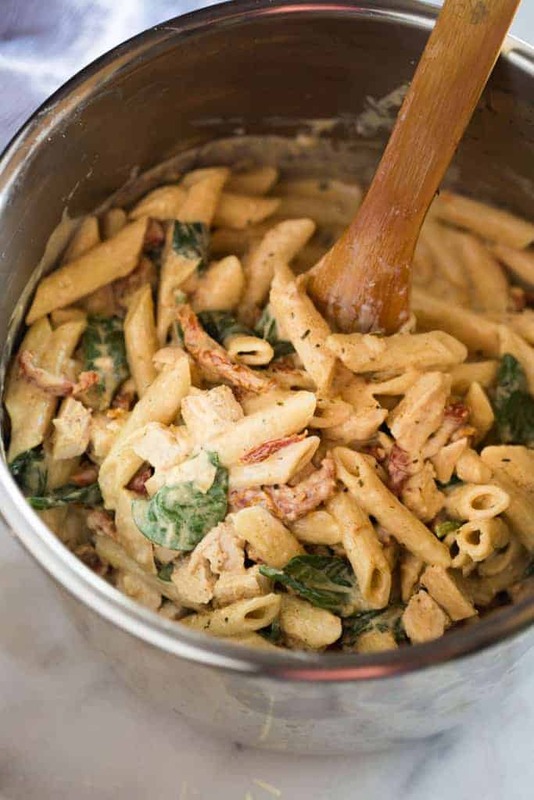 A delicious pasta dish with creamy garlic sauce, sun-dried tomatoes, spinach, and chicken. My family quickly fell in love with this yummy, EASY pressure cooker meal. I’ve found myself using my Instant Pot more than ever in the past few weeks. I especially love it for meals where you can throw all of the raw ingredients together, push one button, and BAM, it’s ready in 15 minutes–Like these chicken taco bowls, or instant pot spaghetti. The key is to cook everything well, without ending up with undercooked or overcooked noodles, or chicken. 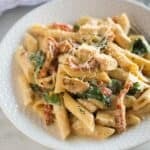 One thing I really love about this tuscan chicken pasta dinner is how flavorful it is. The chicken is seasoned, and browned before you add everything else, and the onions are sauteed also, to give everything more depth of flavor. Instead of water, we’re cooking the pasta with chicken broth, and I’ve added milk and spices to make it creamier and extra flavorful. I hope you all love the end result as much as I do! Start by seasoning your chicken with salt and pepper and paprika. 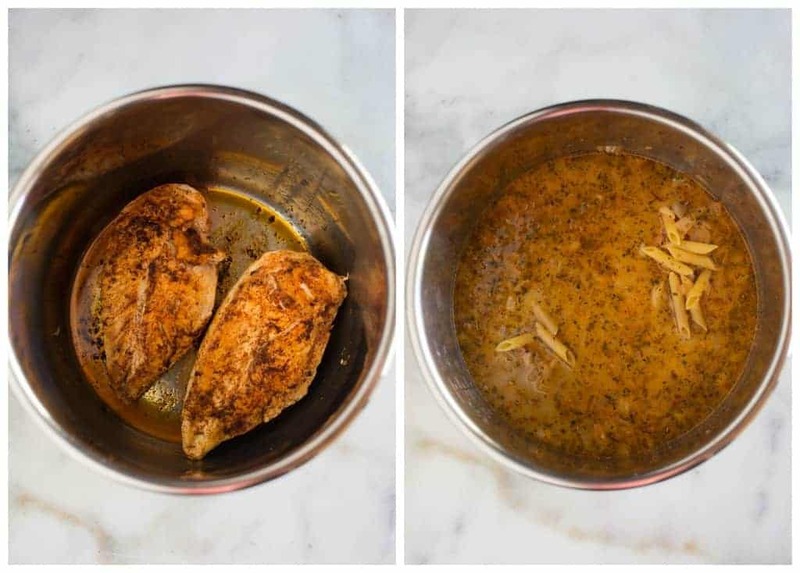 Turn your Instant Pot to saute, and brown the chicken on both sides. Remove it to a plate. Add butter and chopped onion to the pot to saute. Add the chicken broth, seasonings, milk, pasta and chicken to the pan. Cook on high pressure for 5 minutes. When the timer beeps, quick release the pressure and open the lid. Remove the chicken to a plate, tent it with foil and allow it to rest. Add the cream cheese to the instant pot and gently stir it in until melted and smooth. 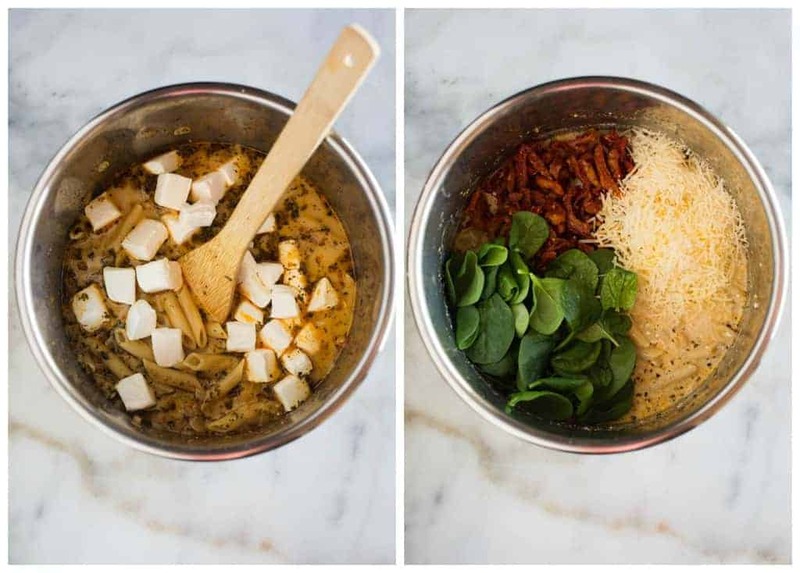 Stir in the fresh parmesan cheese, spinach and sun-dried tomatoes. Chop the chicken and add it as well. Give everything a little stir. Can you already smell the goodness? YUM! Perfect creaminess, and tons of flavor. And now you’re ready to enjoy! Add a little extra garnish of parmesan cheese, cracked pepper and a some crushed red pepper flakes, if you’re into that kinda thing 🙂 . 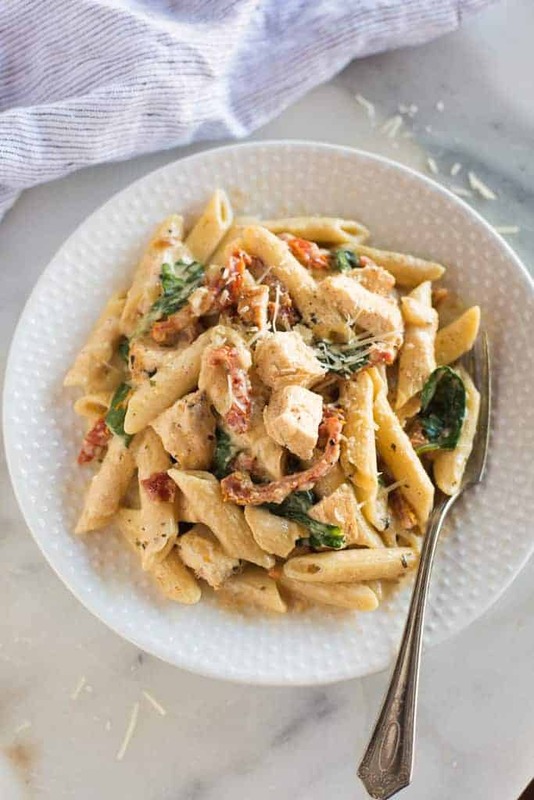 Instant Pot Tuscan Chicken Pasta with a creamy garlic sauce, sun-dried tomatoes, spinach, and chicken. My family quickly fell in love with this yummy, easy pressure cooker meal. Turn Instant pot to saute. Season chicken breasts on both sides with paprika, salt and pepper. Add 1 tablespoon olive oil to the hot instant pot. Add chicken breasts and cook for 2 minutes on each side, until browned, but not cooked through. Remove to a plate. Add butter and onion to the pot and sauté for 2 minutes. Add chicken broth, (scraping the bottom of the pot to deglaze it), seasonings, milk, pasta, and chicken breasts back to pot. Close IP lid and turn release valve to sealed. Cook on manual (high pressure) for 5 minutes. When the timer beeps, turn valve to quick release, to release the pressure. Carefully open lid. Remove chicken to a plate and tent with foil. (Don’t skip this step. The chicken will continue to cook under the foil). Stir in cream cheese, stirring gently until it’s melted and the sauce is smooth. Stir in parmesan cheese, sun dried tomatoes and spinach. Season with salt and pepper, to taste. Chop chicken and return to pot. Sauce will thicken as it cools. Serve warm, garnished with extra parmesan cheese, if desired. Try my other popular INSTANT POT recipes. Mad this last week and my family LOVED this!! My sauce was a bit thin at first too, but thickened as it sat in the pot on keep warm. We ate the left overs a few days later and I think it was even better! My husband just raved about it! I’m already making it for a second time tonight. DELICIOUS! I loved how saucy it was and it thickened up perfectly after cooling for like 10 minutes. This was dish was awesome! I used a 16 oz box of penne pasta.. Didn’t add any extra water. Also used 8 oz cream cheese, didn’t want store extra. Turned out great! Thank you!! My family LOVED this dish! I’m so happy to hear it! Thanks! Do you or can you use frozen chicken breasts for this recipe? Hi Brittany, frozen chicken breasts take about 10 minutes to cook in the IP, so your pasta would be overcooked. If the frozen chicken was cut up into really small pieces it would work, with probably about a 5 minute cook time, with quick release. Hope that helps! Delicious … made it 4 times already. Creamy & pasta cooked perfectly. It’s even better reheated. ? I LOVE to hear that! Thanks so much for sharing 🙂 Hope you get to try more of my IP recipes soon! I just made this recipe in my crock pot pressure cooker. The proportions worked out as expected. But I did modify the recipe to fit my cooking style and families tastes. I am the only one in the family that likes sun-dried tomatoes so I substituted fire roasted red peppers and added artichokes. Along with the cream cheese I also added a little ricotta for more texture an flavor. If I double the recipe, how long would I increase the cook time? As long as your instant pot can fit that volume of food (without reaching the MAX line) it will work great! Use the same cooking time. I do not cook. It’s a major treat for my family when I do…even though it’s not always that good. This recipe is the third meal I’ve cooked in my Instant Pot. I’m always nervous I’m going to overcook or undercook the meat since I can’t check it. Well, this meal was quite a success! I used 3 chicken breasts sliced in half and upped each ingredient by an equal amount. I thought it was too liquidy when I pulled the chicken out, but after adding everything else and having it sit, it is perfect!! So happy you liked it! Thanks for sharing Kylie! I made this last night and it was delicious! I cut the recipe in half as it is just my husband and I, and we do have leftovers to enjoy. Do you think it would freeze well? Also, on step 10, (adding the cream cheese) what do you have the IP set on? Saute, warm or? Thank you.